372 Citizens Climate Lobby volunteers gather on the steps of the Senate, the morning of June 25, the first day of a week of lobbying on Capitol Hill. In 2009, three activists went to Washington, DC, to make contact with government, to discuss doing something in the interest of the public good and the nation’s long-term survival. The idea: deal with climate, protect our future. How to do it: organize citizen volunteers from across the country to communicate directly with their elected officials; cultivate values like knowledge, honesty and respect, and build relationships that help shift the political winds. In 2010, Citizens Climate Lobby brought 25 people from across the US together for three days in June, to meet make 54 visits to Congressional offices in both chambers, in both parties. In 2011, 82 volunteers reached over 140 offices. In 2012, 180 volunteers reached more than 300 offices, and last week, 372 CCL volunteers, including some from Canada, met with more than 439 offices of the United States Congress, as well as the IMF and World Bank. Among those meetings were the lead sponsors of past and pending climate legislation, including a face-to-face meeting with Sen. Barbara Boxer (D-CA), as well as the Republican leadership, including a face-to-face meeting with House majority leader Eric Cantor (R-VA). Part of the work has always been connecting in a human way: it is as important for citizens to have good-spirited contact with their elected officials as it is to push a policy that those officials might or might not adopt. As the movement has grown, it has gathered an immense amount of information and insight into its activities. Over 100 local chapters in the US and Canada include senior citizens, college students, engineers and entrepreneurs, activists, writers, urban farmers, stay-at-home moms, college professors, financial professionals, at least one ExxonMobil manager, a former independent Senate candidate, and a Canadian Parliament staffer. There are reporters, aerospace professionals, and a man who helped to land the Curiosity Rover on Mars. There are insurance risk management analysts, former biology professors, software engineers and new moms. There are people who in their day jobs are working to build the clean, green future, and others who like the vast majority of us, struggle to keep from perpetuating the less-than-clean, not-so-green status quo. The keynote speakers at this year’s conference were Dr. James Hansen, of NASA’s Goddard Space Institute, one of the most renowned and respected climate scientists in the world, and Dr. Shi Ling Hsu, a true polymath who teaches law, has been a prosecutor, and holds a PhD in Agricultural and Resource Economics. Hansen told a personal story and explained how what we know about climate came to be known, while Hsu traced the 10 major points that outline his book, The Case for a Carbon Tax. The conference was inspired, emotional and full of the best quality of information available. One observer rightly remarked that there had never been so many well-informed climate lobbyists on Capitol Hill at the same time, doing the real work of sitting down to discuss policy and process. One Congressional staffer said they had never met any group of activists with so many people so well schooled in the minutia of economic policy-making. “America the Beautiful”, as we all know, traces a long list of beautiful natural scenes, all of which are significantly threatened by the ongoing worsening fallout from global climate destabilization. Again, misty eyes and quivering voices made the sentiment known: “brotherhood, from sea to shining sea.” A week of impassioned, inspired, well-informed citizenship kicked off with the earnest observation that we are stronger in activating participatory democracy, if we do it together as brothers and sisters. The spirit of CCL essentially focuses on finding the most affordable, most reasonable, healthiest and most effective way to improve the world. First, citizen volunteers interacting with their government, second the most affordable efficient way to solve the climate crisis, third the openness to build a bipartisan coalition of real allies, and then to move the country and the world forward in a way that is better for everybody. Analysis from the Carbon Tax Center has shown that without any collateral assisting policies, the Carbon Fee and Dividend would make renewables as or more affordable than fossil fuels within ten years. With the removal of heavy subsidies and favorable tax treatment for fossil fuel companies, and the massive capital investment expected to flow to clean energy resources, parity would likely come within 5 years for much of the country. The Carbon Tax Center’s research has also shown that at least two-thirds of households would receive more in the dividend than they would pay in distributed rising costs across the fabric of the economy. The Carbon Fee and Dividend plan is not intended to use consumer pain as leverage (as are “sin taxes” on tobacco and alcohol and other energy consumption taxes). This plan is intended to give consumers and businesses time to diversify their portfolio but to send a clear and resolute price signal to the marketplace, shifting the calculus for major investors and motivating huge quanities of private capital investment to flow into the development of clean energy infrastrucutre, job creation and next generation research. This kind of investment is the kind that does not “cost” society, but rather coincides with increased job creation, a rise in average household wealth and the middle-class edification of more stable, more vibrant communities, which in turn spark still more economically virtuous feedback loops. Getting the arc of the relationship between escalating carbon fee and the diversity of energy sources available right allows the transition to a 100% clean energy economy to be smooth, painless and defined by increased prosperity and quality of life. What’s more, it allows Republicans to sign onto a “tax” policy that actually helps to reduce the cost burden imposed on taxpayers. The total cost of subsidies, tax credits, loopholes, write-offs, rebates, health costs and other externalities, paid by taxpayers to the carbon-based fuels industry, is estimated to be $4.5 trillion a year, globally. Passing Carbon Fee and Dividend will relieve taxpayers of that burden—itself a failure of the marketplace—by way of a market-based price signal that motivates private investment. The plan has always played well with Republicans and conservatives, but there has always been a great deal of caution to get involved in anything that could be counted as “a new tax”. On Tuesday, June 25, Pres. Barack Obama, after having warned Congress that he would act if they did not, announced strict and far-reaching new regulations, which conservatives oppose. The new regulations proposed by Obama respond, in part, to a Supreme Court order that the EPA regulate excess carbon dioxide emissions, under the Clean Air Act, if Congress fails to take action. They include: EPA intervention to reduce CO2 emissions from coal plants, a strict new standard for approval of the Keystone XL tarsands pipeline, and a mandate that all entities receiving federal dollars consider the cost of rising sea levels. Conservatives in Congress want to replace the regulatory solution to climate destabilizing emissions with a less restrictive, yet more effective market-driven solution. Carbon Fee and Dividend might be the only way to accomplish anything like that. Other types of carbon tax can work, too, but none are likely to be as efficient or as conducive to major creative advances in American enterprise and energy that will expand average household wealth, not put it under added pressure. 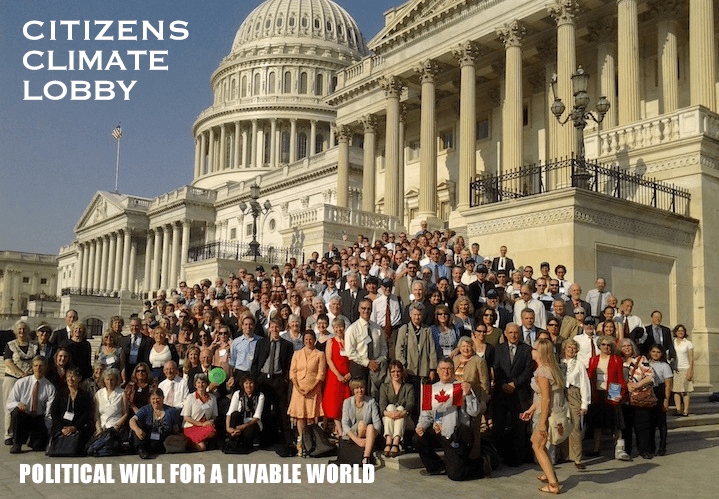 CCL will continue to lobby the United States Congress and the Canadian Parliament, the IMF, the World Bank, and other major policy-making institutions, to motivate this people-centered, democratic open market policy, to confront the world’s worsening climate destabilization crisis and to speed the transition to clean, renewable fuels. Always, this mission will line up with the work of restoring power over government to the people, through engaged, active, informed citizenship. UPDATE, Oct. 8, 2013: In the first nine months of 2013, Citizens Climate Lobby volunteers, from 131 active local chapters in the US and Canada, published 873 letters to the editor, 153 op-eds and 79 news articles on climate and energy policy. They gave 69 TV and radio interviews, met with 33 editorial boards and inspired 39 editorials. They also had 639 meetings with staff or elected officials in the US Congress and the Canadian Parliament.